Do you have to enjoy something sweet after your meals? Do feel like your meal is incomplete without that sugary bite? Or, do you crave sugar in the afternoon as your energy wanes? You’re not alone. Many people feel “addicted” to sugar, or powerless to overcome their sugar cravings. Since added sugars contribute extra calories without much nutrition, eating too much of the stuff can greatly increase your risk of becoming overweight or obese and developing diet and lifestyle related chronic diseases such as type 2 diabetes, heart disease, and even cancer. Did you know that the average American adult consumes 19.5 teaspoons of added sugar each day? This is far above the World Health Organization’s recommendation of no more than 6 teaspoons per day. If you’re tired of feeling controlled by sugar, and are ready to kick your habit for good, follow our simple tips for reducing the amount of added sugars in your diet and reprogramming your taste buds to crave tasty whole foods. A green salad with avocado or nuts for healthy fats, chicken or tuna for lean protein, and starchy fruits and vegetables like peas, corn, or dried or fresh fruit for healthy carbohydrates. Drizzle with olive oil and balsamic vinegar, instead of using bottled dressings, since they tend to be loaded with added sugars. Or make your own salad dressings. Choose an open face sandwich or slice a hearty piece of toast length wise to get two slices! Whole grain breads or sprouted grain breads provide healthy carbohydrates. Top with canned salmon, grilled fish, sliced turkey, lean beef or cheese for protein, avocado or hummus for healthy fats, and veggie toppings for added fiber, vitamins and phytonutrients. Go crazy on the veggies to up your nutrient power. Try baby greens, cucumber, tomato, pickles, red onion, or even bell pepper! Create a balanced meal by serving a grilled or baked protein, sautéed vegetables, and whole grain on the side. For example, one of my favorites is grilled marinated pressed tofu, sautéed Asian vegetables with ginger and garlic, served over brown rice cooked with unsweetened green tea or low-sodium vegetable broth instead of water. Come up with your own easy and exciting trios for simple weeknight dinners. 2. Enjoy a variety of flavors. Try to include salty, sweet and umami tastes at a meal to increase satisfaction. For example, try my recipe for an Easy Green Lunch featuring sautéed vegetables, kale, beans, and feta cheese. The sauté is drizzled with Bragg’s liquid aminos and balsamic vinegar for a salty-sweet umami kick, and the cheese, beans, and kale are savory. Add Portobello mushrooms for an even more savory bite! 3. Choose whole food treats. When craving a sweet snack, first try riding out the craving wave for 15 minutes, if you still have it, opt for a whole food treat. 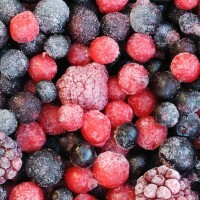 Frozen berries are an amazingly satisfying treat. Try raspberries, blueberries, grapes, or even pineapple! Sliced green apple dipped in fresh ground honey roasted peanut butter is simply divine. Slice a fresh or frozen banana (they are so delicious), top with almond butter and sprinkle with 1 tablespoon of cocoa nibs. Plain Greek yogurt topped with quickly heated frozen cherries, chopped walnuts, and cinnamon. Blend a frozen banana with almond milk and little leftover coffee for a sweet and natural pick me up. Add vanilla or almond extract for a flavor boost. If chocolate is your thing, choose varieties that are at least 70% dark. The darker the chocolate, the more antioxidants youâ€™ll get. Plus, dark chocolate is so rich and satisfying, it is much harder to mindlessly overeat. Learn how to choose the best chocolate. See more ways to Outsmart Sugar Cravings.